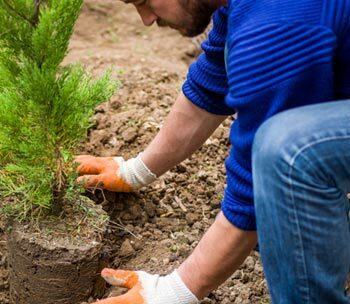 Preparing to plant a tree, shrub or perennial on your property requires some preparation. 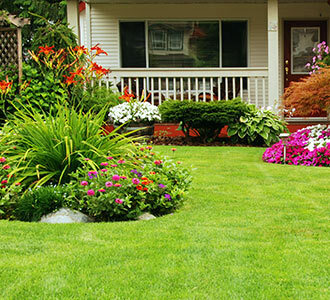 The experts at Greenbloom Landscape Design can help you effectively prepare your new plants and soil to help promote healthy and effective growth for the coming years. The method you use can help determine how well the plant establishes itself in your garden. Ensure you prepare your plant and the site to help the plant grow well. Plants can be purchased container grown, bare rooted, or balled and burlapped. Perennials are most often purchased in containers. If you purchase the tree, shrub or perennial before you are able to plant it, keep it watered and in a sheltered area for protection. If your plant came in a container, make sure it is well watered before removing it. If it is a bare-rooted tree or shrub, soak the roots for approximately 30 minutes prior to planting. If it came balled and burlapped, remove the twine and burlap from the root ball. For bare rooted plants, snip off any roots which are broken or damaged. Keep the plant in water until the planting hole is ready. Dig the hole as deep as the root ball of the plant or the size of the container, and two to three times as wide. With bare rooted plants, dig the hole wide enough to accept the spread-out roots. Consider investing in mycorrhizae. These fungi form a mutually beneficial/symbiotic relationship with the roots of your plant. Through this relationship they naturally develop and mutually reinforce themselves without causing any harm to each other. The fungi help bring water and nutrients to the plant’s roots and the plant provides sugars needed by the fungi. The addition of a mycorrhizae will help stimulate root growth. Trees and shrubs with mycorrhizal–enhanced root systems adapt better and are more tolerant of stressful environments. Make sure to choose the variety suited to your plant. Remove the plant from its container by laying it on its side and pulling off the container. Loosen the root ball by breaking it apart gently to free the roots. If the roots are tightly matted, you may need to use a knife. This will not hurt the plant. Place the plant in the hole, ensuring it is centered and straight. Move the plant by the root ball, not by the plant itself. The top of the root ball should be level with the ground. Position the plant so the most attractive side faces the spot from where you view the plant. Fill in the edges of the hole using the soil you removed, two-thirds of the way and water well to help settle the soil. Fill the rest of the hole and water again. The addition of a transplant starter to the water can help minimize transplant shock. Firm the soil with your foot, leave a saucer-shaped basin of soil at the base of the plant to collect water. For bare rooted plants, mound the soil and then spread the roots out on the mounded area. The base of the tree where the trunk starts to taper out into roots should be at ground level. Fill the hole and water well. Check for any settling and add more soil if needed. Mulch the planting area to help reduce growth competition from weeds and grass as well as to conserve moisture. Do not pile the mulch up around the trunk of trees. 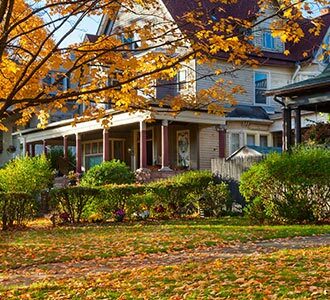 Newly planted trees, shrubs and perennials should be checked every day for the first two weeks and watered as needed. After two weeks, limit watering to once a week or every ten days if less than 1” of rain falls. It is better to water less frequently for longer periods of time so that the soil is moistened to the entire depth of the root mass than to water lightly and frequently. A deep watering encourages the roots to grow down toward the water table rather than form a shallow root system near the surface. This will result in a much hardier plant.